The above equation indicates one-to-one correspondence between Ep and P. The control action can also be expressed in terms of the Proportional Bandwidth (PB), defined as the error required to cause a 100% change in controller output and is usually expressed as percentage of the chart width. If error is zero, the controller output is constant (=Po). In case error signal is present, the proportional controller output needs a correction of Kp% for every 1% error (EP). There is an error band about zero, having magnitude = PB, within which the output is not saturated at 0% or 100%. 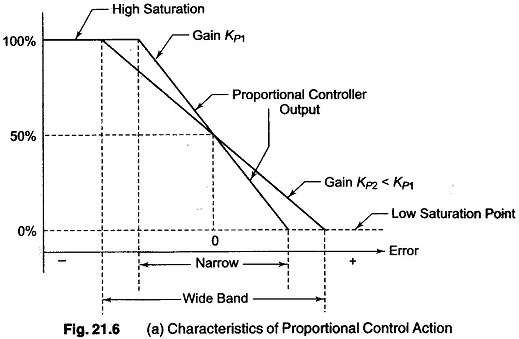 The characteristics of a proportional control is as shown in Fig. 21.6 (a).